I had suggested in an earlier post that there may be some more good news to share in April. The good news is we are not moving any time soon! Interestingly enough that could have gone either way and still have been good news. If you have been following this blog long enough you know that we moved to Iowa with the purpose of serving in ministry. Due to a serious breach of trust and promise by a Pastor that seemed to be off the table. However, last year ministry work continued in the form of pulpit supply. My wife and I met many amazing people along the way and have more Christian connections in Iowa than I thought possible in such a short time. One of the churches we ministered at has been looking at us as candidates for an open Pastor position. That would require about a three-hour move away. We now know that is not where God wanted us. However, in an attempt to find local churches in need of pulpit supply I came across an ad seeking a Pastor in a nearby Baptist church. This was in early March. It seemed unlikely that they would consider using me for pulpit supply but I answered the ad anyway. In the initial message I asked to speak with someone from the church. The intent was trying to avoid an automatic rejection because of denominational differences. Within a very short time a church elder called me. While I was on the phone with that gentleman I got a message from a lady we know that was excited to hear we were possibly interested in this church. I know news travels fast in small towns but wow! That phone conversation ultimately led to an interview with several of the church members. I gave them an audio copy of a previous message for their review and felt encouraged to have met this great group of people. It was roughly a week later that I got a call to preach a live message in April. After the service we had a potluck fellowship. At this point they had narrowed their search down to two applicants. The following Sunday I got a call that the church had voted in favor of hiring me as the next Pastor. The position starts in May. There are several noteworthy events that made this possible. The first one was I had never heard of the website the church advertised on. In fact it was 3 or 4 pages deep on an internet search for open churches. I am not normally that patient in internet searches. Another noteworthy event is the place where I am employed has a solid reputation in the community and the church encouraged me to stay with the job. Along with that the timing of transferring to a day shift position eliminated a concern about being available for pastoral responsibilities. Even the circumstances around the shift change were outside the normal protocol at the company I work for. Right now I do not feel qualified to lead a church. Maybe God was waiting for me to get out of the way so He can lead me. Well this is week one. The first week of being on first shift along with the first week of book sales. Still not quite sure how either one happened but I’ll take it! The dogs are in the habit of getting up around 2:00 A. M. to be let outside. It’s what they have been used to for the last year. Unfortunately I am not used to sleeping in the middle of the night so we are all in for some sleep adjustment. As for the book, the sales report looks like a snail on a mission. Not at the 101 sales mark but I am very optimistic about reaching that goal… some day. This will be the last post about this book until the sales goal is reached. It has no literary value. It was written and published by an amateur. It has the word “farts” in the title. It will make you laugh and that would be undignified. It is full of one-liners and such that I posted on Facebook over the years and you never had to pay for that. By the way a huge thank you to those of you that have purchased a copy! I also thank God for the end of a difficult life season. There are several lessons learned along the way and I look forward to sharing them with you in future posts. Enjoy the weekend everybody! Somehow I managed to accidently release the paperback edition of my book today. My daughter once called me road kill on the information superhighway. There is some truth in that! This is a compilation of funny one-liners, quotes, and random absurdities. If you are looking for a serious read this book is not for you. This was written as a project for friends that have encouraged me to write a book highlighting some of my humorous and random posts on social media. I am serious about a few things. However much of life can be viewed from a funny perspective. That is what this book is about. This is not a book meant to be read straight through like a novel. Enjoy it at your own pace. If you are able to read this book in its entirety without giggling, snorting, or laughing out loud then please have your pulse checked. It’s been longer than usual between posts. My attention has been on compiling a book that I started a couple of years ago. 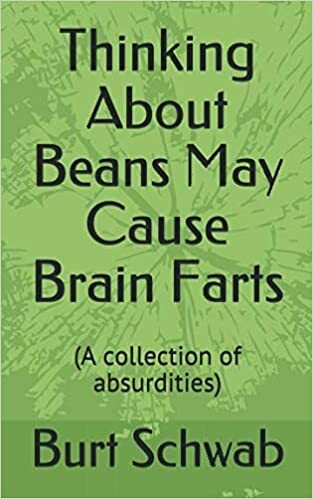 The title is ‘Thinking About Beans May Cause Brain Farts (and other absurdities)’. Long title for a book full of one liners and very random thoughts. The content of the book is various humorous posts I put on Facebook over the years. A few friends, yes I have friends, have encouraged me to create a compilation of funny stuff. I plan to publish in April through Amazon. P.S. I am off social media for a several more weeks so please respond directly to this site. Thanks.